An Update to End All Updates (Not Really) Children of Time: The Companions of Doctor Who Available Now! It’s been a busy few months as I’ve recently finished the final edits for Madame Vampire (which is now getting a nice cover made for it) and started a new novel tentatively titled Goodbye, Fare Thee Well. 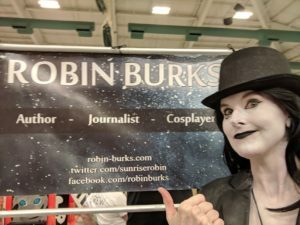 I also started covering news for ScreenRant and appearing at a few cons. That doesn’t leave a lot of time for leaving notes here, but I try to remember when I can. To start with, I want to thank Ken Murphy and the staff of Cape Comic Con for such a wonderful event this past weekend. I got to meet a lot of amazing people, including those interested in my books. Thank you to everyone who came by my table to say hello, as well as thank you to those who purchased books or just came to chat with me about reading and writing. It was an amazing weekend and I hope to get to do it again next year. With that being said, I’ve got another appearance coming up in a few weeks. I will be at WHOlanta May 4-6 at the Hilton Atlanta Airport in Atlanta, Georgia. I’m looking forward to hanging out with a lot of awesome Doctor Who fans, but I’ll also be doing a few panels, too. I hope to see some of you there! I will have books available for sale, too, of course, so please come by and say hello. After that, it’s a quiet summer with cons I’m just doing for fun, including my annual trip to Metropolis, IL for Superman Celebration. I’ll also be hanging out at Fanboy Expo in Knoxville, TN this year. So if you’ll be at either of those events, please track me down and say hi. Then it’s back to work in September with three cons, which are all listed on my Appearances page. Then I’m going to need a vacation, so I guess it’s a good thing I have a trip planned to Walt Disney World in October, right? All in all, I’m hopeful for a great year. I’m looking forward to getting Madame Vampire out there for you all to read, as well as start working on a few other things I’ve got in the pipeline. I look forward to seeing you all wherever I end up, and as always, feel free to drop me a comment or an email if you feel like it.